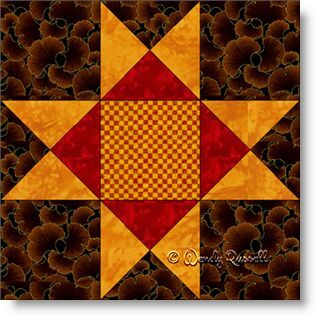 The Ohio Star quilt block design is probably one of the oldest and most commonly used. It is a great block to use to teach beginner quilters as it introduces them to the quarter square triangle patch which is common in dozens of quilts. By altering the placement of colour in the block, so many interesting variations can be made. The sample quilt layouts show how different this quilt block looks when it is set on point (with a light background) or with each block side by side. Sashing has been set between the blocks to further separate them and add more colour to the quilt.